For businesses of any size, contemplating technological change and re-wiring their business model can appear daunting. It’s easy to grasp the end game but often not understand what is involved. The result is that the change becomes a Herculean effort, impacting costs, resources and time. Leaps and bounds have been made in the fields of IT in the past 15 to 20 years. Technology has become agile, meaning the process for change is far more responsive than ever before. It’s a way of thinking that has un­derpinned tech based business in our digital age – they are constant works in progress. Even the giants of the digital age remain in a constant state of development to one extent or another. Businesses are racing to understand what the digital age means for them. Their consultants and suppliers are more keenly aware than ever that making appropriate changes are key to successful changes. The days of one-size fits all solutions are well behind us. In our daily lives, mobile digital techno logy has taught us that we can have a very bespoke digital experience and this is permeating through to our thoughts about corporate technology. Property risk professionals, panel managers and valuers can all now implement IT solutions that help to improve risk management using timely and accurate externa l data regarding flood and subsidence risks, as well as build quality and sustainability. 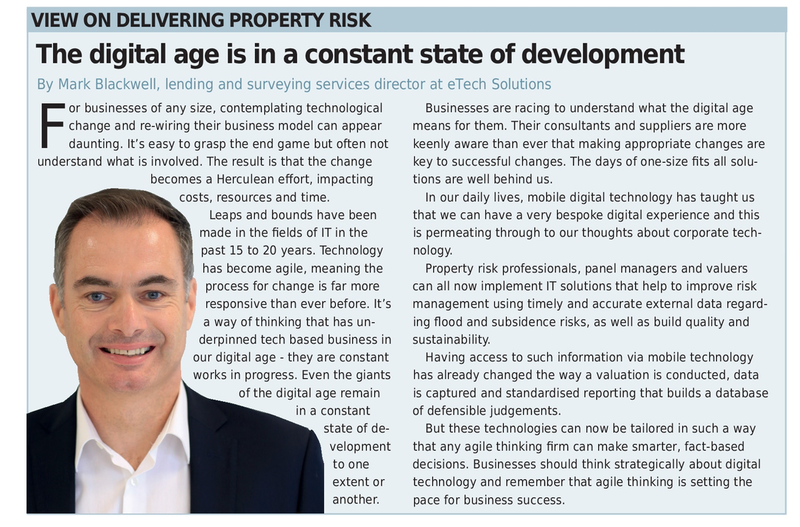 Having access to such information via mobile technology has already changed the way a valuation is conducted, data is captured and standardised reporting that builds a database of defensible judgements. But these technologies can now be tailored in such a way that any agile thinking firm can make smarter, fact-based decisions. Businesses should think strategically about digital technology and remember that agile thinking is setting the pace for business success.